Could that be the inspiration for the many holiday lights that fill our community throughout the season? Or perhaps it’s just our resistance to the daylight savings time change, plunging us into the dark an hour earlier each winter evening. Whatever the reason, the post-season electric bill is probably the one gift you wish you could return. While I’d like to recommend you consider saving the energy and hours of untangling and hanging thousands of blubs outside your house, I don’t really want to take the chance of becoming known as the ‘Environmental Scrooge’. So instead, may I suggest you trade-in your outdated incandescent holiday lights and ‘deck the halls’ with LED holiday lights? Switching to LED lights can mean a higher initial investment, but the real savings comes from reducing your holiday energy costs. As this year’s holiday advertisements rolled in, I noticed many stores offering trade-in and discounts on LED holiday lights. Do a little legwork, comparison shop wisely and you’ll save yourself some green for your pocket. Also, don’t forget to look for sales after the holiday – it’s a great way to gain additional savings for your holiday wonderland. A quick search on the Internet points to a multitude of cost savings models demonstrating what can be realized by switching from incandescent bulbs to LED lights. Most comparisons start with the assumptions that the average home holiday light display contains at least 500 light bulbs (a conservative estimate for some spirited neighborhood competitors), that the light strings are turned on from sunset to bedtime (6 hours per night), and that the season lasts a minimum of 30 days. In the average holiday light string each incandescent bulb (C7) uses 6 watts. When we compare the LED bulbs usage of .08 watt each, it’s not hard to imagine the savings boost for your holiday decorating fever. So not to completely bore you with the price of kilowatt hours in the PG&E 3, 4 and 5 tiers, let me just say that the larger your holiday light tradition, the more dollars there is to save. If saving green for your pocket or ‘doing good’ for the planet isn’t your thing, then consider that LED lights are more durable and safer to run than incandescent lights. LED bulbs generate less heat improving the life span of your holiday twinkle. You can expect LED light strings to last up to 100,000 hours – using our assumptions above at 180 hours a season – your LED lights will outlast Santa! The limited heat output of LED bulbs that contribute to their lifespan also provide safer illumination. Definitely worth considering as you trim your family Christmas tree this year. Of course, there are advantages of LED lighting over traditional bulbs and CFLs beyond the holiday season. While incandescent 100-watt bulbs have been phased out throughout the US, the cost savings of replacing these inefficient blubs still in your home with LED or CFL is over 75% energy savings. PG&E has a simple efficiency chart online that shows the watts for different bulbs at various lumens (brightness) which can be found at http://www.pge.com/myhome/saveenergymoney/rebates/light/products/index.shtml. As a honest disclosure, I am not a big fan of CFL bulbs. Each of these bulbs contains a small amount of mercury which means used bulbs must be treated as hazardous waste. 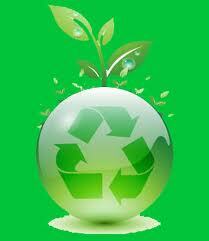 That means it is against the law to put these bulbs in your landfill or recycling bins. Instead, please bring them to your local Ace Hardware or Home Depot that as a courtesy to their customers, will properly dispose of your residential CFL bulbs. Also, PG&E has a fact sheet, Recycling CFLs: What You Need to Know http://www.pge.com/includes/docs/pdfs/myhome/saveenergymoney/rebates/factsheet_recyclingcfls.pdf including important information about proper clean-up procedures for broken CFL lights. Please keep your family safe and follow these valuable instructions. 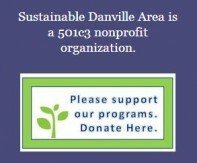 Sustainable Danville Area hopes the joy of connecting with your family, friends and neighbors over simple meals and activities will light your holiday season and all the days of the New Year. As ‘tradition’, there will not be a forum in December, so that we can devote time to our loved ones. We hope to see you next year, when The Danville Library and Sustainable Danville Area host a three-part speaker series, FOOD FOR THOUGHT, to nourish your spirit, feed your mind and body and help the environment. 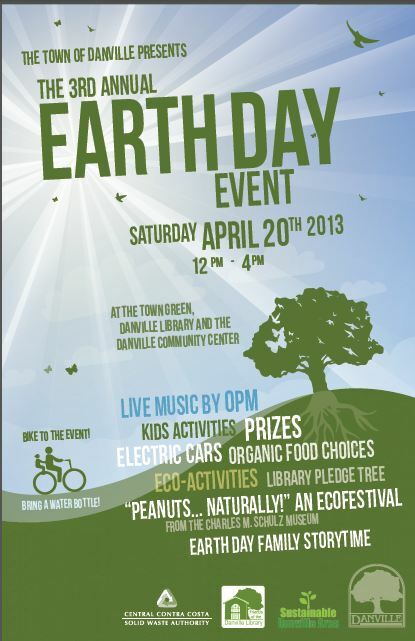 For more information, please visit us at www.sustainabledanville.com and on Facebook.